While a laptop on stage is not an uncommon site these days, most performers try to minimise the screen’s involvement in the show in the eyes of the audience. If you can spot the computer at all, it’s usually off to the side, lid half-closed. Even complex pop shows with synced visuals and lighting tend to usher the laptop off-stage, safe from any sweat or beer damaging it’s fragile components. But new wave star Thomas Dolby is taking a different approach on his current tour, putting the laptop front and centre and giving the audience a closer look into what’s going on under the hood. 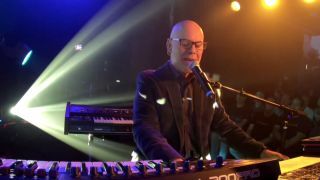 Kicking off his tour with a show live-streamed from Roland’s newly opened Los Angeles Artist Relations Centre, Dolby’s stage setup was made up of a laptop with several MIDI controllers, Roland’s TR-08 Boutique drum machine, and most importantly, several models of Cloud instruments, all at the ready. The show would feature Dolby building the tracks up, one layer at a time, utilising several Roland Cloud instruments in each song. The show is the first of many events that Roland has planned for the Cloud community, according to VP of Marketing Paul McCabe. Dolby, whose long and varied career was kicked off in 1982 with the then-foreign sounding single “Blinded By Science”, is no stranger to utilising any means possible to get his story across. He now spends much of his time teaching “Music for New Media” at Johns Hopkins University in Baltimore, where Dolby admits he’s learning as much from the students as they are from him. We sat down with Dolby after the live-streamed performance in a room packed to the gills of legendary Roland boards to dissect his newfound-take on performance, Roland synthesizers, and balancing teaching with life on the road. So, today you had your old Jupiter 4 on stage with you. Did you lug that out to shows when you were just starting out? Obviously, times have changed quite a bit, and you’ve never been one to shy away from embracing those changes, from your use of the Fairlight back in the ‘80s to your early uses of sampling. Today you’re running a large part of your show using Roland Cloud instruments. How did you come across the Roland Cloud Platform? “So, I’ve been using Roland equipment for a long time, starting with the Boss Dr. Rhythm Drum Machine when I was a busker in the Paris metro in the late ‘70s. My first polyphonic synth was that one that you saw on stage, the Jupiter 4. Just four voices, but I did a lot of my early recording with that. “Then I went up to the JP-8, I had a big rack with some Roland rack gear in it because I needed to combine synths and samples. So, I had this huge rack and then they came out with that one (pointing to a D-50 leaning against the wall), which is basically both in the same instrument. “The downside of all this analogue stuff though, unfortunately, is that it’s heavy, it’s hard to stay in tune, you can lose the presets and things like that, so I’ve gone more towards doing everything in the laptop these last few years. Do you still use any of your old analogue boards? “No, I don’t really. They take up a lot of space and my wife wants them out of the house! And sometimes a knob or a fader will go down and that sort of spoils the whole thing for me. 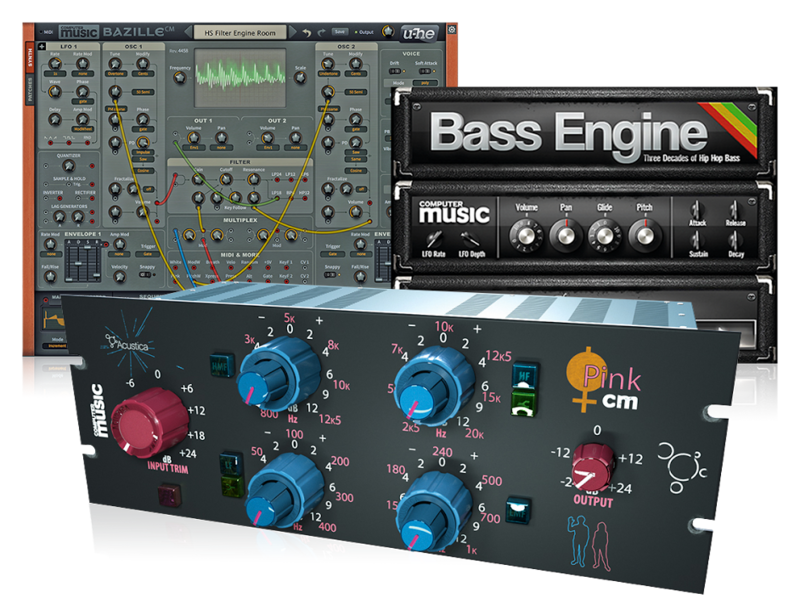 Do you have a favourite Roland Cloud emulation? This was a bit of a special show for you, as it was streamed live on Facebook right out of Roland’s studio. How different was this show from your normal ones, both in terms of setup and how you approached it? “I played at Largo, a club in Hollywood, and I played for a couple of hours and the format that I’m doing on this tour allowed the audience to pick the songs that I do. And I deconstruct the songs a bit more than I did at the Roland show. You took a very layered, loop-based approach to building up the songs right in front of the audience. Is that something you’ve always done or did that really start when you got more into using the laptop as a performance tool? “If you watch me layering and looping these songs, you might think I compose that way but in fact I compose pretty much in my head. And I’ll generally go to the piano first, to work out the chords and melodies, and write some lyrics before I go anywhere near a synth. “Having said that, very often I’ve been fooling around with sounds and I come up with something so inspiring that the song comes out of that. For example, I did a song called ‘Wind Power’ with a very early PPG Wavetable synthesizer I had and the wavetables were so bizarre that sometimes you would hold down a note and it would have a rhythm to it, just from scanning through the wavetables. Do you ever have trouble remembering them? That’s an incredible skill to have! “Yes. I’m not a trained musician but I’ve developed my intuitive music skills because I’ve never spent any time reading music, writing it down, writing down chord charts, practising – I never practised in my life really! So I think I’m a bit of an idiot savant in that respect, and the irony is that I’m now teaching at one of the country’s greatest music conservatories and I’m surrounded by students who are concert pianists and virtuoso violinists and they can play, read, or write circles around me. If you want to find out more about the Roland Cloud then check out the website, where you will also find a free 30 day trial subscription.